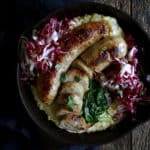 Italian chicken sausages, creamy cheddar polenta with a kick, and a crisp radicchio pear slaw…the perfect combination for a quick and healthy meal. 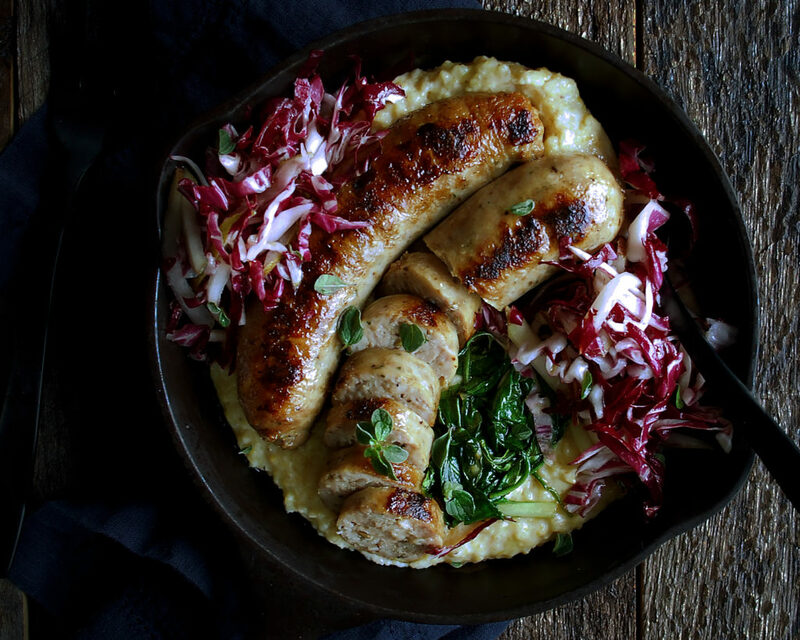 If you’re an Italian sausage fan like me, you’re going to love this. I usually only eat sausage on special occasions, but figured I’d give chicken sausages a try (they just seem more acceptable for a healthy mid-week meal). And honestly? I could barely notice a difference. I got mine at Whole Foods…they were labeled “mild Italian chicken sausages” in the meat department. So, so good! I got the mild ones instead of spicy because I had also found this really interesting “rattlesnake” cheddar cheese, which turned out to be way spicier than I even imagined! I added it to sweet honey polenta, though, so that definitely toned it down a bit. Plus, I made a really simple, crisp radicchio pear slaw to cut even more of the heat. I’m telling you this stuff was hot! And in the end, this dish turned out to be something I absolutely loved. It’s the perfect balanced meal and takes no time to prepare. Ps…if you can’t find a spicy cheddar cheese like I did, just use regular cheddar cheese and add a pinch of cayenne pepper. 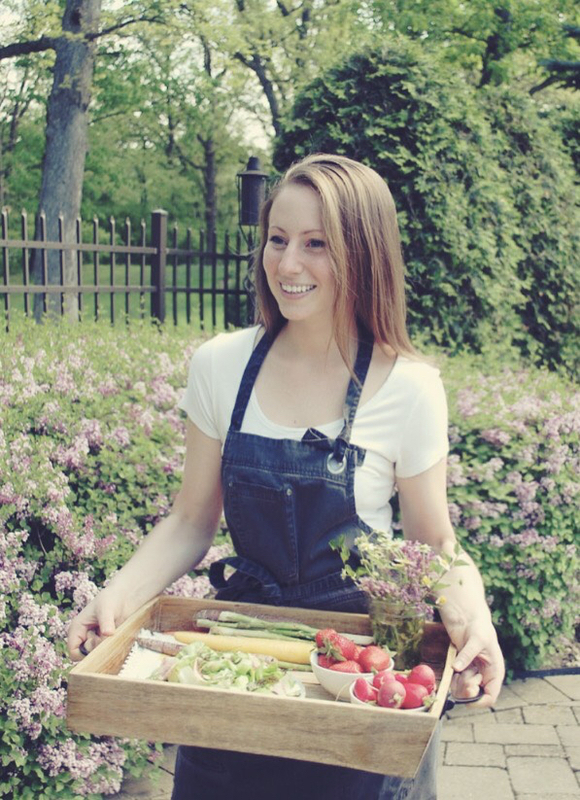 Combine the milk, honey, and fresh oregano in a heavy-bottom pot. Bring to a bubble over medium heat and allow the honey to dissolve. Slowly whisk in the cornmeal until incorporated. Lower the heat all the way down and continue to cook the cornmeal until smooth and tender, stirring often. Remove the oregano sprigs. Stir in the spicy cheddar cheese. Season with salt to taste and keep warm until serving. Meanwhile, heat a large sauté pan over medium high heat. Add enough oil to coat the bottom of the pan. When the oil is sizzling hot, add the chicken sausages. Sear them on all sides until caramelized brown. Cover the pan with a lid, lower the heat to medium low, and let steam for about 5 minutes until the sausages are fully cooked through. Remove the sausages from the pan, leaving the fat behind, and add the spinach. Quickly sauté the spinach until tender. Season with salt and freshly cracked black pepper to taste. Meanwhile, toss together the radicchio, pear, lemon juice, and olive oil. Season with salt to taste. 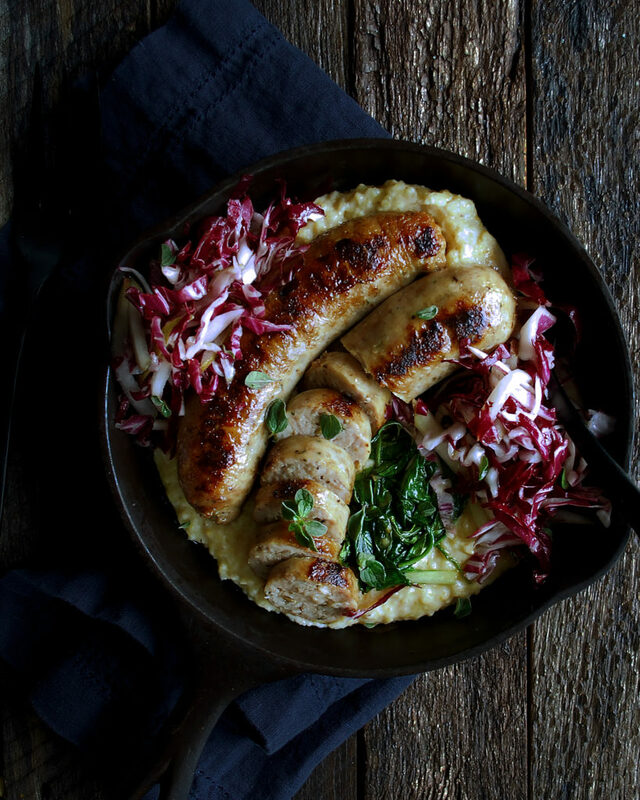 Plate the polenta first with the chicken sausages on top. Add a bit of spinach and radicchio pear slaw to each plate. Garnish with fresh oregano leaves.